A Five-Star hotel represents the ultimate in luxury and sophistication. Guests can expect first class accommodations, consistently superlative service and careful attention to detail in all aspects of their stay. Amenities typically include heated swimming pools, whirlpool tubs, fitness centers and spas, valet parking, bellhops, and concierge service. A five-star hotel may feature up to three gourmet restaurants, and room service is often available 24 hours a day. The lobby of a five-star hotel is sumptuously appointed and guest rooms feature designer quality furnishings and fine linens. Most five-star hotels are large properties, but some of the smaller properties listed in our "Top 50" offer intimate and romantic settings which cannot be matched by a larger hotel. Five-star luxury hotels are often located in downtown areas of major cities, but may also be found in wealthy suburban areas and resort destinations. On this page, you will find a list of luxury hotel chains whose properties are often considered of "five-star" caliber. You will also find our list of top independent (non-chain) hotels in the USA, sorted by state, as well as links to other top-ranked lodging information. Canadian hospitality firm features luxury hotels in major city centers and desirable resort destinations. 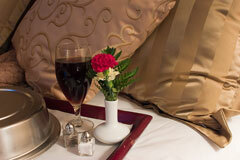 Features grand hotels providing the finest personal service and facilities throughout the world. Texas-based hospitality firm features unique hotels and resorts in leading cities and resort destinations. The ambience and style of each property is designed to accent its location's culture, history and geography. These desirably located luxury hotels offer excellence in standards of hospitality and elegance. Raffles Hotels & Resorts is a collection of luxury hotels located in major cities around the globe. Each hotel is a landmark in its respective city, and most are positioned at the top of their local markets. Properties include Raffles L'Ermitage in Beverly Hills as well as hotels in Singapore, the Caribbean, and Europe. Family of individual hotels and resorts, each with their own distinct personality. This luxury brand strives to provide service that is gracious and sincere, with an oriental flavor. The Hongkong and Shanghai Hotels Group features luxury Peninsula Hotels in Beverly Hills, Chicago, and New York as well as in several East Asia locations. Features luxury Regent Hotels in Beverly Hills, California and South Beach, Florida which provide business and leisure travellers with high standards of luxury hospitality. Arizona Biltmore Resort • Phoenix, Arizona. The Phoenician • Scottsdale, Arizona. The Beverly Hills Hotel • Beverly Hills, California. Calistoga Ranch • Calistoga, California. The Lodge at Torrey Pines • La Jolla, California. Hotel Bel-Air • Los Angeles, California. Chateau du Sureau • Oakhurst, California. Rancho Valencia Resort • Rancho Santa Fe, California. The Lodge at Cordevalle • San Martin, California. Casa del Mar • Santa Monica, California. The Little Nell • Aspen, Colorado. The Broadmoor • Colorado Springs, Colorado. The Mayflower Inn • Washington, Connecticut. Delano Hotel • Miami Beach, Florida. The Fisher Island Hotel • Miami Beach, Florida. The Breakers • Palm Beach, Florida. Ponte Vedra Inn & Club • Ponte Vedra Beach, Florida. The Lodge at Sea Island • St. Simons Island, Georgia. Mauna Lani Bay Hotel • Kamuela, Hawaii. Mauna Kea Beach Hotel • Kamuela, Hawaii. Princeville Resort • Princeville, Hawaii. Grand Wailea Resort Hotel • Wailea, Hawaii. Windsor Court Hotel • New Orleans, Louisiana. Bellagio Hotel & Casino • Las Vegas, Nevada. The Venetian • Las Vegas, Nevada. The Carlyle • New York, New York. Lotte New York Palace • New York, New York. The Point Resort • Saranac Lake, New York. The Sanderling Resort and Spa • Duck, North Carolina. Fearrington House Inn • Pittsboro, North Carolina. Walden Country Inn • Aurora, Ohio. The Rittenhouse • Philadelphia, Pennsylvania. Charleston Place Hotel • Charleston, South Carolina. Wentworth Mansion • Charleston, South Carolina. The Sanctuary at Kiawah Island • Kiawah Island, South Carolina. Woodlands Mansion • Summerville, South Carolina. The Hermitage Hotel • Nashville, Tennessee. The Mansion on Turtle Creek • Dallas, Texas. Mokara Hotel & Spa • San Antonio, Texas. Stein Eriksen Lodge • Park City, Utah. The Grand America Hotel • Salt Lake City, Utah. Twin Farms • Barnard, Vermont. The Inn at Little Washington • Washington, Virginia. Keswick Hall • Keswick, Virginia. Jefferson Hotel • Richmond, Virginia. The Greenbrier • White Sulphur Springs, West Virginia. Canoe Bay • Chetek, Wisconsin. The American Club • Kohler, Wisconsin. Conde Nast Traveller's choice of establishments based on location, rooms, service, ambience and design, food, and/or leisure facilities. Top ranked hotels around the world, in various categories.